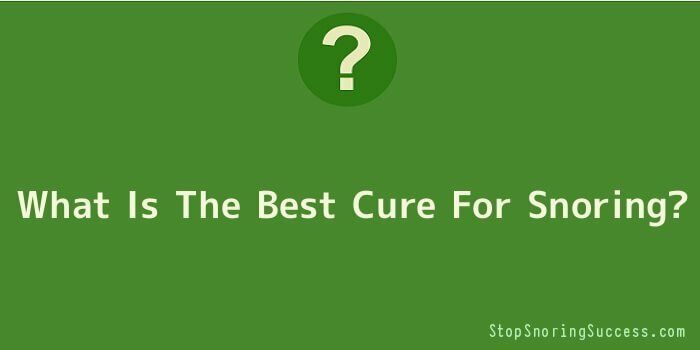 What Is The Best Cure For Snoring? For those of us who have serious snoring problems there are several medical treatments available, some of which include surgeries and dental devices, and yet other methods, such as changes in life style and some homemade solutions. However, the best cure for snoring for an individual depends greatly on the causes of snoring and the amount of money the person is willing to spend on reducing or eliminating their snoring problem. Most of the people who struggle with a snoring problem usually have some problem with the palate. The Pillar system reduces the problems created by the palate by firming the palate. The Pillar procedure is looked upon as a minimally invasive surgical operation and is primarily offered to people who have a snoring problem considered as serious. It is also offered to those patients with moderate OSA. Basically, the surgery consists of inserting three extremely small polyester inserts right into the soft palate. The area of insertion is usually numbed with a local anaesthetic by the doctor. Since the Pillar procedure is so effective in decreasing the vibration that creates the irritating snoring noises and also in preventing the soft palate from blocking the air passages, it is generally considered as one of the best cures for snoring. The inserts helps the palate in maintaining its structure. As time goes by tissue firms up in the areas surrounding the inserts which firms up the palate and reduces the snoring noises cased by vibration. The firmness of the palate will continue as long as the implants are in place. The procedure is performed by a doctor in his office. He does not remove any tissue during the procedure. One of the pluses with the Pillar procedure is that it creates very small amounts of discomfort, and the recovery time is also rather short. The people who take advantage of the operation can eat and perform their daily activities at the same day as the surgery. By many professionals the Pillar system is considered to be the best cure for snoring that is available. Typically, patients see a significant reduction in their snoring in about four to six weeks. The majority of patients only require an over the counter type of pain pill to deal with the minimal discomfort they sometimes feel after the undergoing the surgical procedure. Some of the other surgical procedures that have been suggested to be the best cures for snoring are painful and invasive.